The longstanding German Christmas market is back in action all month long, taking place in Daley Plaza in the heart of the Loop shopping district. That means there is plenty of time to stock up on various knickknacks, ornaments, and gifts, but it also (and just as importantly) means there&apos;s ample opportunity to get your fill of hearty, soulful holiday fare. Much of the items up for eating and drinking at Christkindlmarket come with a German accent, from the burly schnitzel sandwiches to the buttery pretzels, but there&apos;s something for everyone and every craving at this magical metropolitan wonderland. The first thing you&apos;ll notice upon entry to Christkindlmarket — which is free and open to all — is the heady, toasty aroma of sweet holiday spice. The scent radiates throughout the festival, luring visitors to one of the many dessert stalls for a taste. Much of this aroma can be chocked up to vendors like Pemberton Candies, which slings English toffee and gourmet chocolates, as well as the Chocolate Covered Treats & Baked Apples. Or grab some still-warm donuts from local favorite Dinkel&apos;s Bakery. The end all-be all of treats, however, is Sweet Castle. This is the spot to fill up on miscellaneous roasted nuts in dizzying varieties, along with German cookies, popcorn, cotton candy, and stollen, that ubiquitous German holiday cake on par with American fruitcake. Despite what we might hope, we can&apos;t subsist on candy alone. So you&apos;ll need to balance all that sugar with some schnitzel. Germany&apos;s famed fried pork sandwiches are best experienced at the aptly named Schnitzel House, which specializes in the classic comfort food, along with chicken sandwiches, German-style burgers, potato pancakes, and goulash. Another solid savory option is DönerMen, a Chicago-based company slinging curry wurst sausages, kebabs, curry fries, and other staples of Berlin. 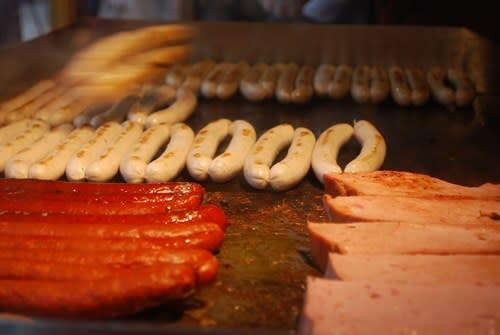 German Grill House will be serving up different varieties of sausages, along with crispy potato pancakes. And don&apos;t forget the pretzels from Stuffed Gourmet Pretzels. The doughy treats come in various flavors, many of which are chock full of tasty filling. Other edible options include gooey baked cheese from the Baked Cheese Haus. These Wisconsin cheesemakers specialize in the pungent Alpine raclette and other baked cheese that are sure to keep you toasty on a cold night. 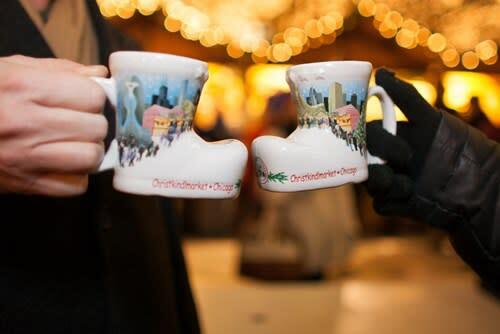 The Christkindlmarket&apos;s most famous beverage is Glühwein, aka German hot spiced wine, served in collectible ceramic mugs. The drink is available at the various Beer & Wine Vendors throughout the market. One pro tip: head to the heated beer tent to cozy up with some spiced wine and live German music. There&apos;s also plenty of non-alcoholic beverages to keep you warm, like premium loose leaf teas from TeaGschwender and cocoa from Bob&apos;s Belgian Hot Chocolate. 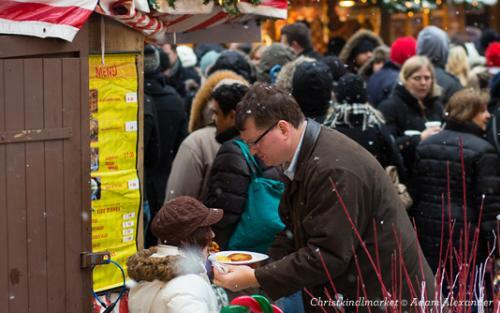 Visit christkindlmarket.com to plan your visit, and find more seasonal celebrations across Chicago at choosechicago.com/holidays.